The regigate appliance flexibly integrates into your message flow without requiring changes to your existing solutions for filtering, content checking, virus scanning, archiving, data protection or other applications for data protection and security. The regigate appliance acts as an MTA and therefore works with any other SMTP appliance that you are using. You can define the policies for encryption and decryption by using the regigate rule-engine or your existing applications. When processed, the messages are re-turned into the existing message flow. Flexible routing with any number of routing channels and individual rules. Rules for deciding the encryption and decryption process based on headers, attachments and other information from the e-mails as well as matching these values with any list. Up to 200.000 regimail transactions per day (depending on the virtualization system used and the network connection). Various scaling options through HA mode (High Availability via Floating IP). 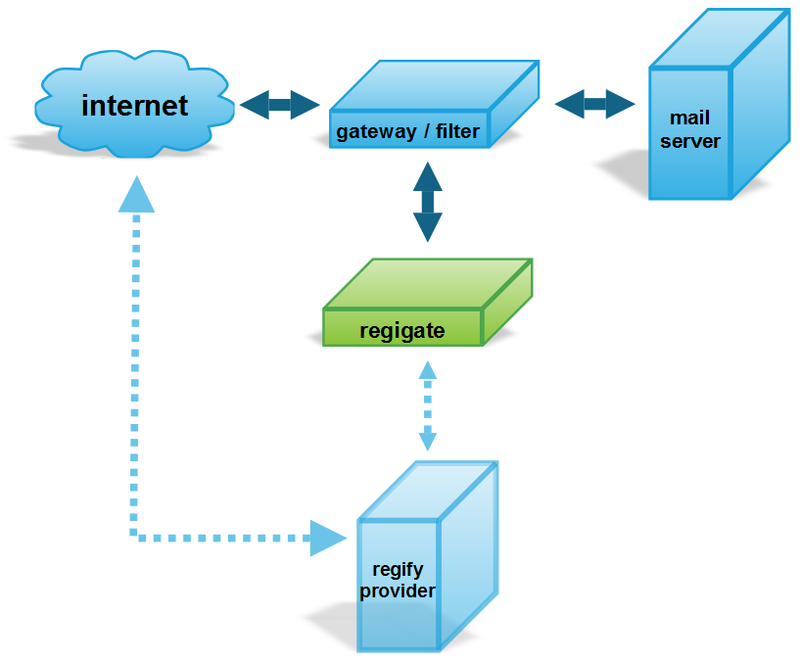 In order to use regigate, you need to be either a regify provider by yourself or you use a sub-provider at another regify provider. Contact out sales team for further information.